The Mosquito Coast – An eccentric and dogmatic inventor sells his house and takes his family to Central America to build an ice factory in the middle of the jungle. This movie was brought up during our review of The Omega Man over the topic of ice. It’s a tragic tale of a very stubborn dad. Lots of highs and lows that make you really pick sides in this family struggle while they try to bring ice to the jungles of Central America. Ice is civilization! 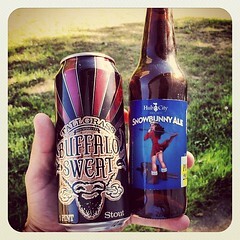 This episode is brought to you by That Bead Girl and we’re drinking Buffalo Sweat and Snowbunny Ale. If you’d like to be responsible for the beer or movie we review, get in touch.